Fluency First! 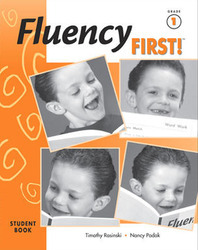 is a scientifically research-based fluency program based on the Fluency Development Lesson, cited by The Report of the National Reading Panel, 2000, as an effective instructional model developed by Dr. Timothy Rasinski and Dr. Nancy Padak from Kent State University. At the heart of Fluency First! are repeated and monitored readings of high-interest text to promote mastery of fluency, word recognition, and comprehension.